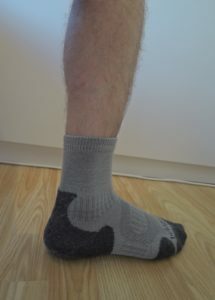 For the past years I have been trying to find the perfect sock for 3 season use. There were so many different brands and materials tested that I lost track. Not perfect yet, but good enough and the best so far. The saving hand comes from Bridgedale, a Northern Ireland based company, today a world wide recognised brand. Bridgedale Merino Light Hiker are a pair of socks for warmer climates. Whether this is hiking, trekking or just around the city, this will provide the comfort your feet need. In both men and women versions and a few colour choices. They even make a thicker version. Retail price is £16, quite steep if you ask me, but almost always at half price from Cotswold Outdoor. The size true to fit. I’m a 7 UK ( 41EU) and M was just right. You can’t really go wrong with a pair of socks. And they do fit nice and snug but without being too tight. The length is exactly how I like it – a few inch. The material is a mix of different types of fabrics, but the most important is the Merino wool (30%). Simply can’t beat it when it comes to comfort, warmth and moisture management. The synthetic materials add a better temperature control ( Nylon -30%, Polypropylene 30%, Elastane-8%). IT also features a cushioned sole for better protection against blisters and a better fitting overall. Socks are probably one of the most easiest products to test. You just need a pair of decent boots and the will to go out. Maybe more than one time to get a better overview of its performance. Nevertheless one should pretty much know from the first use if it’s a winner or not. The Merino Light Hiker makes no exception. The quality is there, it’s comfortable and fits well. It keeps warm on those chilly evenings around the camp, but not that worm so you can’t wear them during the summer days. If you are unlucky enough to hike in 30C+ temperatures it might feel a tad too warm. Does a decent job in winking moisture and won’t give you any blisters. If you’re planning to do a multi trip hike and wash cloths on the move be aware merino doesn’t dry that quick. I washed them in the afternoon and were still humid the next morning while other synthetics had dried already (indoor). I prefer comfort though so not complaining. 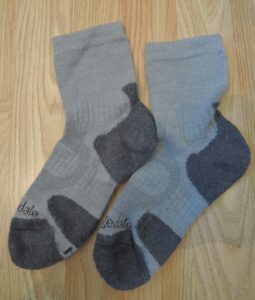 While is just a pair of socks, happy feet means high moral. You might have the best boots ever made but it won’t really matter if you have some cheap ebay plastic socks that traps moisture and irritates your skin. Get them at discount and would still worth the investment. No more compeed or creams. Took the boots out of the box and left for Haute Route. Even if my heel felt a bit sore at times, there wasn’t even a scratch. I think that says it all.